Family history has never been more popular than it is today. However it can be a daunting process. With so many different online commercial routes to learn your ancestors past, it can be difficult to know where to begin. However, we can probably point you in the right direction. With an eye for detail, we can assist you in identifying and dating any artefacts and photographs you may have. To many a uniform may seem "just WW1" or "WW2," but buttons and badges changed regularly throughout the Regiments life, so using these, we can accurately date images. Uniforms too and the style in which they were worn, changed through time again allowing us to pinpoint exact dates. A typical example is the photograph on the right. 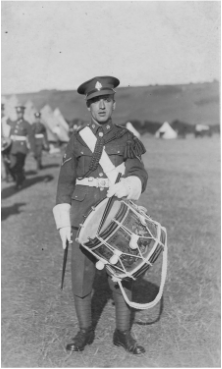 It may seem at first glance that this Drummer is just an ordinary WW1 Suffolk Soldier, however from examining the photograph in greater detail, we can tell that it was taken after the First World War due to his service dress cap being of a pattern introduced in 1922. The style too of wearing his trousers with his putties in a 'plus-four' style, was very iconic of peacetime soldiering. The drum too, upon closer examination, shows the emblazons of the Great War Battle Honours, granted in 1922, so we know that it is past this date. The scroll too shows that the drum and drummer belong to the 4th Battalion. Finally, the tented scene in the background shows that this was most likely taken on an annual T.A. training camp sometime in the mid-late 1920s. It's amazing at just what a few details can do to bring life to a photograph. Difficult too, can be the seemingly unending ravel of surviving military paperwork. For those lucky enough to have a service record that has survived the Second World War (many personnel records were destroyed in the Blitz), these can often given an amazing insight into a soldiers service. Attestation papers such as that left, can give us an interesting insight into a soldier's families, health, religion, and details of any previous military service (in the Militia and Territorial Force). Closer examination of other paperwork such as paybooks; which often survive with relatives, can help to piece together your relatives service with The Regiment. At a quick glance, we can tell you whether your relatives had false teeth, wore glasses and whether they were allergic to any form of poisonous gas. We can also determine too if they had an insurance policy or whether they had been graded as 'politically undesirable' or had a 'lack of moral fibre'. 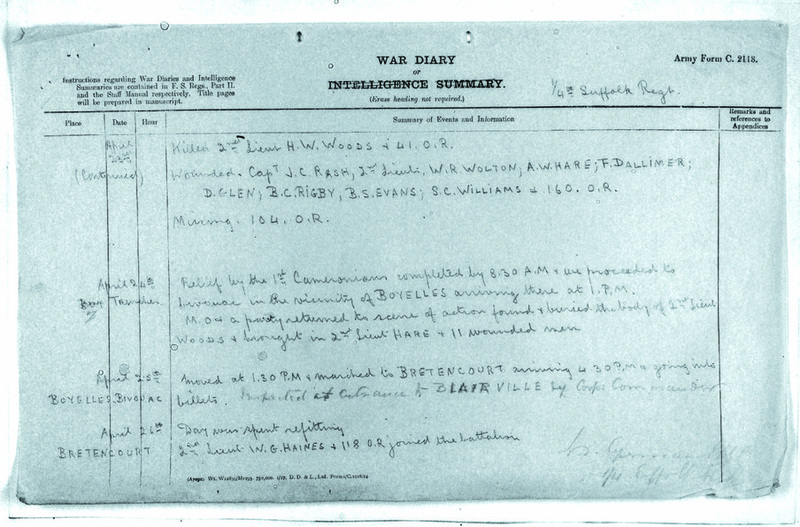 In addition to this, we also have access to many of the Battalion War Diaries (a typical sheet of which is shown below) from the First World War, and a few from the Second World War as well. If you are looking for something specific, we can give you a short cut to get to the information you require rather than trawling through reams and reams of microfilm at the National Archives. Never ever be afraid to ask us - you never know someone might have even asked the same thing before! We hope that the Friends can help you in your research. Main Picture: Battalion Machine Gun Team, Bury St. Edmunds 1933.